Mobile map users exceeded 220000000 people in China. 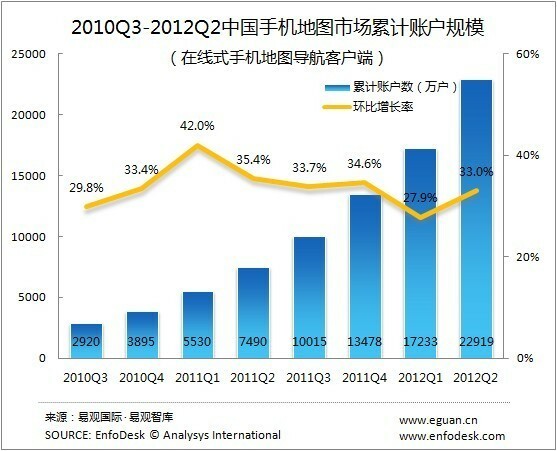 According to the report by Eguan, mobile map users were 229190000 people in China as of the second quarter. It was the first time that the number exceed 200 million people, and it was increasing 33.0% compared to the previous period. Baidu Map increased 3.7% of their market share compared to the previous period, but on the other hand Google Map decreased 5.7% of their market share. Google continue to lose their position in China, but they can catch-up their position again or not in the future... We have to keep watching their actions.